Lucknow, 2018.01.13 (Times of India, with input from DJ) : The UP government is planning to rejuvenate the almostbarren Govardhan Parvat, which has huge mythological significance for Hindus, by reviving flora of Dwapar Yug along its 21-km perambulation path. The Indian Agriculture Research Institute (Delhi) and the Dehradun Wildlife Institute have been roped in for the project in Mathura. The Yogi Adityanath government is planning to promote the state’s religious sites for tourism in a big way. Yogi had formed the Brij Tirath Vikas Parishad just two months after Rampur assuming office. 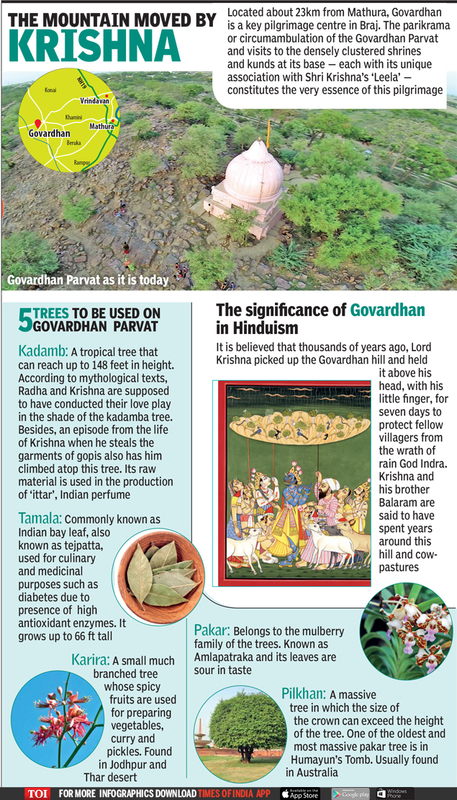 The CM, who is also the chairman of the parishad, has tasked it to find five varieties of trees: kadamb, karoli, tamal, pakkad and pilkhan (ficus virens) and develop the vegetation around Govardhan Parvat to resemble what has been described in the sacred texts. Mythology has it that Lord Krishna picked up Govardhan hill, and held it above his head with his little finger for seven days to protect villagers from incessant rain, a result of the wrath of Indra. “In Hindu mythology, kadamb was the favorite tree of Lord Krishna, who used to play the flute and play with his friends under its shade. We’ve sent our research team to find this tree in Rajasthan’s Karoli Dham area. The entire Govardhan project is being monitored by the CM,” said Braj Tirth Vikas Parishad CEO Nagendra Pratap. In a recent report to the CM, the parishad said the hill’s green cover had shrunk over the years and it was necessary to preserve its sanctity as it was intrinsic to Hindu culture and mythology. The government has sanctioned Rs 226 crore as the first installment for the project. Forest officials blame brackish groundwater in Mathura for poor vegetation on the hill. The Parishad now plans to use water harvested from neighboring Bharatpur district in Rajasthan for irrigation around Govardhan Parvat, said Pratap. In the team, Shri Kant Chandola of Apex Grade of Forest Department, Prof. Amit Kotia, Jharkhand specialist from Uttarakhand, Jai Prakash, Ranger DP, Deputy Inspector Brajesh, including Neera Radia’s son Akshay Radia. A team of botanical scientists, led by Dr. G.S. Rawat from Dehradun’s Wild Life Institute, arrived in Govardhan on Saturday in order to carry out a survey for the greening of the hill. The team inspected dried-up trees, roots buried under the soil, scattered branches and took soil samples for testing. They are testing the soil and water to see what is needed to revive this flora. Dr. Rawat said that his team is exploring the possibility of returning the 21-km length of Govardhan Mountain to its legendary greenery. Ancient plant species will be found by looking at historical and religious books and species that are currently extinct in the area will be revived. Dr. Rawat said that the Govardhan is geologically one of the oldest mountains in the world, around three and a half trillion years old. Its roots are so deep that in a manner of speaking, the is whole world is standing on it. By way of comparison, the Himalayas are mere babes. He pointed out one tree and said that it was 175 years old. Another member of the team, Akshay Radia, said that after completing the survey, the team will present their report to the Braj Tirtha Vikas Parishad. According to Radia, one of the purposes in greening the mountain of Akshay Radia is to cultivate medicinal plants from the Ayurveda materia medica. He said that he is preparing a list of such plants and that this work will be carried out with the help of local residents, who know that traditionally there were always many Ayurvedaic herbs growing there. “It is clear that if we can make Govardhan hill greener, then Ayurvedic medicines will also grow,” said Dr. Radia.